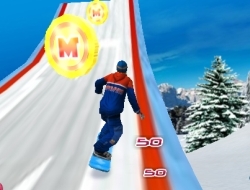 If you didnt have the chance to go snowboarding this winter, this winter game will surely replace that awesome feeling, without the freezing weather. You are a professional skateboarder and the goal is to score as many tricks as you can on the tracks. There will be lots of ramps to jump off, you just have to time your jumps well to get the most air time from each one. Try to collect the miniclip coins if you see them and they will add to your score. The more tricks you do in one jump the more score you will get, so try to link them one after the other. If you fall however, the score will not count and you will lose lots of points. Check out the combo list and do the most dangerous tricks you can find in it. Freestyle Snowboard 10.00 between 0 and 10 based on 1 votes.